Need a Valentine’s day crafting idea? Check out these envelope clutches I’m working on! I came across the idea for this project on pinterest. 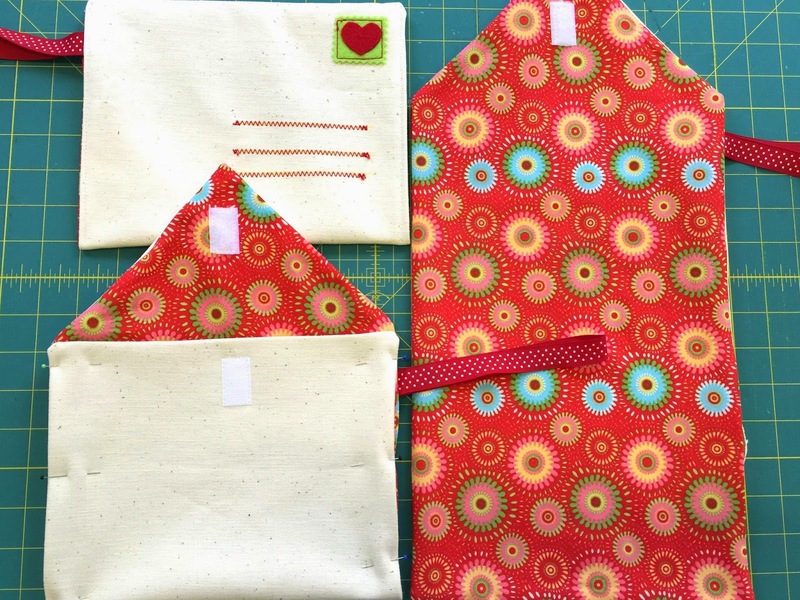 The set of 4 felt envelopes made by missprettypretty (and sold on etsy) was for children’s imaginative play. Very cute. But the girls I’m making these for are older so I tweaked the materials and size and came up with a little clutch instead. Please pardon my sloppy sketch – but I figured a diagram with measurements would better explain my pattern than a wordy paragraph. Suffice to say, I wanted my finished envelopes to measure 9 inches by 7 inches. I machine sewed the envelopes with 1/4 inch seam allowances. And if anyone needs more details on how to make your own pattern, please do comment in with your questions. Create paper pattern. Again, I wanted my finished envelope to measure 9 inches across and 7 inches high. I also added in margins for quarter inch seam allowances. 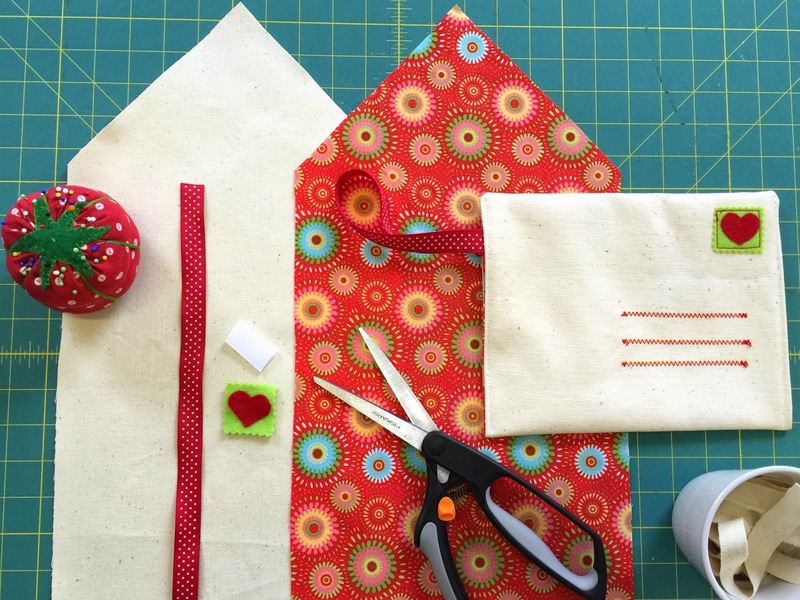 If you want a different sized envelope or sew with larger seam allowances, be sure to adjust for that. Cut 1 envelope body and 1 envelope lining. 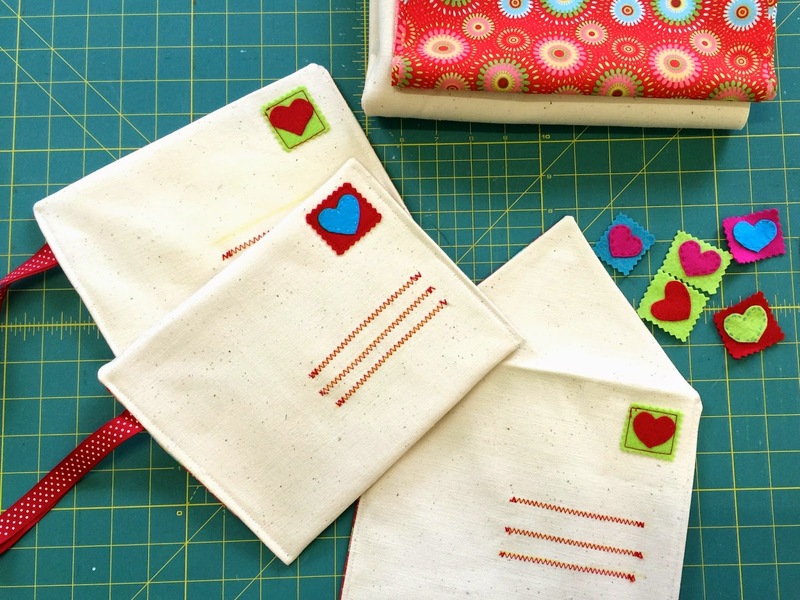 Create stamp by cutting small rectangle from felt with pinking shears. 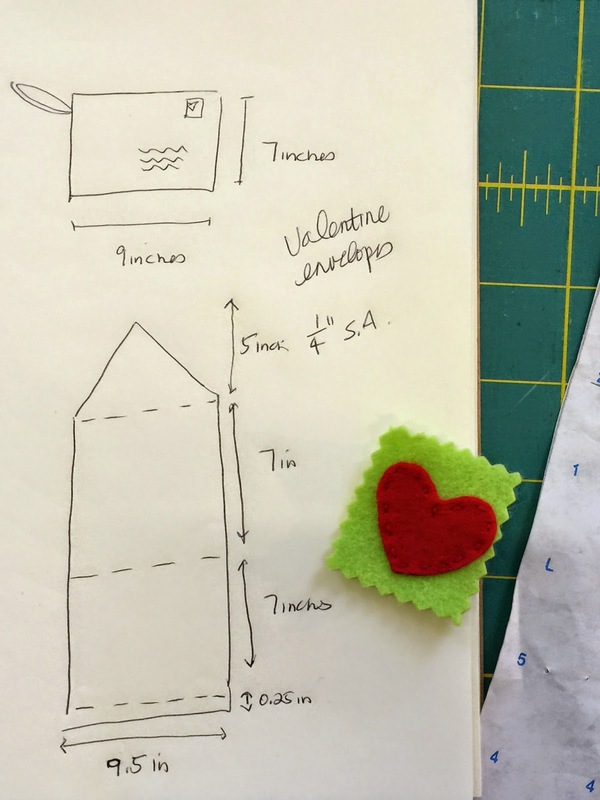 Cut out heart (or whatever shape you want) and hand stitch heart to felt rectangle. Machine stitch felt stamp to right side of envelope body. Machine zigzag the “address” to envelope body. I used fabric chalk to mark the lines I wanted to zigzag. I used red thread for all decorative machine stitching. Sew bristly side of velcro to right side of envelope body. Note, for my first three envelopes, I sewed the velcro on where you see it pinned above. However, I think it should actually be moved away from edge another inch or so. You’ll want to play with this little. Optional: Sew soft side of velcro onto right side of envelope lining flap. It’s actually kind of tricky to get velcro placement on the flap correct. If you don’t mind stitching through both lining and body, I’d recommend sewing this piece of velcro on after you sew the envelope together. Pin envelope body and lining right sides together. If you want the ribbon strap, pin this into place as well (ribbon should be folded in half and tucked between right sides of body and lining). Stitch around perimeter. Be sure to leave an opening to flip fabric right sides out. I leave my opening toward the bottom third of one of the long sides. This way, I’ll sew the opening closed when I fold the fabric and sew the side of the envelope up. Clip excess fabric around corners and points (making sure not to clip seams). Flip fabric right side out. Use your fingers to push all corners out. 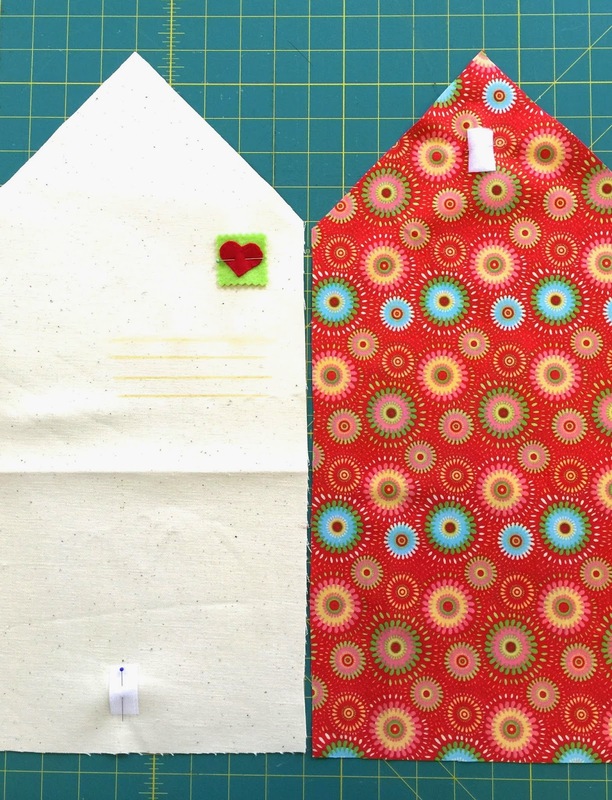 Fold bottom up (with lining tucked inside) to form envelope shape. Leave a little space below triangle portion so there is room to fold the flap down. Edge stitch the envelope sides closed. If you haven’t already, then sew soft side of velcro to envelope flap. I think these little envelope clutches are adorable. I still have some sewing to do since I intend to gift one to each of my sewing girls and to my little niece for Valentine’s. 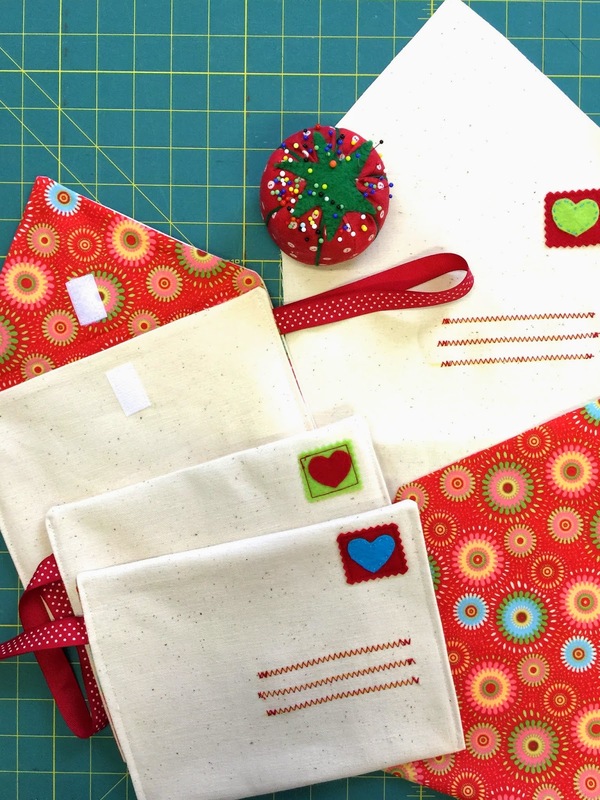 Hoping the girls will be as tickled with these as I am and will be further inspired by another idea of what they use their developing sewing skills to create. NYC schools are closed today. My boys woke with smiles plastered on their faces and high expectations for this surprise holiday. Reminds me of my childhood snow days. While it was still dark, my brother and I would jump out of bed, run to the living room and click on the radio. We’d hunker down and wait for the school closing lists to be read. Can’t describe how wildly happy a snow day made us. But if you grew up with them too, you understand, yes? Standing in the dark. Knowing you got a whole extra play day. The possibilities felt endless. No rushing to school. But we rushed to get dressed nonetheless. Long johns. Snow pants. Moon boots. Coats, hats, scarves and gloves. I loved to start my snow days shoveling the driveway. No idea why. But to this day, I get happy thinking about shoveling snow. We’d roll snowballs. Build forts. I’d wander down the street to fetch my best friend. We’d go sledding down our favorite hill and then head back to her house for hot chocolate. Sometimes my mom would build a fire in our fireplace. And then it’d be over to my house to sit by the fire and melt little chunks of cheese on sausage for our afternoon snacks. Happy, happy days. Today’s snow day is not feeling quite as exciting to me. The city’s snow plows have been hard at work and cleared our neighborhoods streets early on. There’s no hill to sled on (and not enough snow and too much security to build the ramp down the stairs in the park again). Winds are blowing. Skies are grey. It just seems wet, cold and miserable to me this morning. But I look at the shining happiness in my boys faces. They’re excited to go out for a run in the snow and a possible snowball fight. And then, of course, it will be home again for a cup of hot chocolate and some home baked chocolate chip cookies. What kid doesn’t love a snow day? It was supposed to be 3 little needle felted pigs standing on a needle felted field of green with 3 little houses behind them and a ferocious slavering wolf towering over them. But recent distractions have resulted in almost no crafting. All I have to show today are the pigs. These are Woolbuddy designed “Mr. Binks” pigs. I’ve noticed an increase in needle felting designs and kits out on the market. But my favorite continues to be the Jackie Huang’s Woolbuddy kits. I love his simple, cute and cartoon-like animals. Just saw there’s a big snow storm blowing in tomorrow. Perhaps that will provide the downtime and inspiration to build the backdrop for these guys…. but in the meantime, think I’d better boogie over to the grocery store in case we really are facing snow days this week. When I need a little help getting into clean-up-mode, I tell myself I only have to put away 10 items. Shoes go in the shoe closet. Coats are hung up. Groceries my husband left on the counter get stored away (apparently, I’m the only one who can make all the new groceries fit in the pantry). If I’m really tired and cranky, I might put exactly 10 things away and then collapse onto the couch. Putting away 10 items is more than put away none. So at least there’s a little sense of accomplishment. But more often than not, by the time I’ve put the 10th item away, I’m in full form. I do the dishes. Fold laundry. Maybe clean out a drawer or organize a cabinet. Clean up begets more clean up… would you agree? For the past 6 months, I’ve been playing a bigger version of my clean-up game with myself. It started after I finally got all that stuff from my destroyed storefront out of my apartment. Somehow, even after I moved equipment and craft supplies into my new studio, I couldn’t get over the feeling that my apartment was still too full. Kind of like you think the spider is still running around in your hair even after you brushed it onto the ground and stomped on it…. How to deal with the surplus? I don’t think of myself as an excessive shopper, but I’d amassed quite a bit (can’t point the finger at any of my guys). What if…? What if I gave away 10 things? Nah. Not enough. 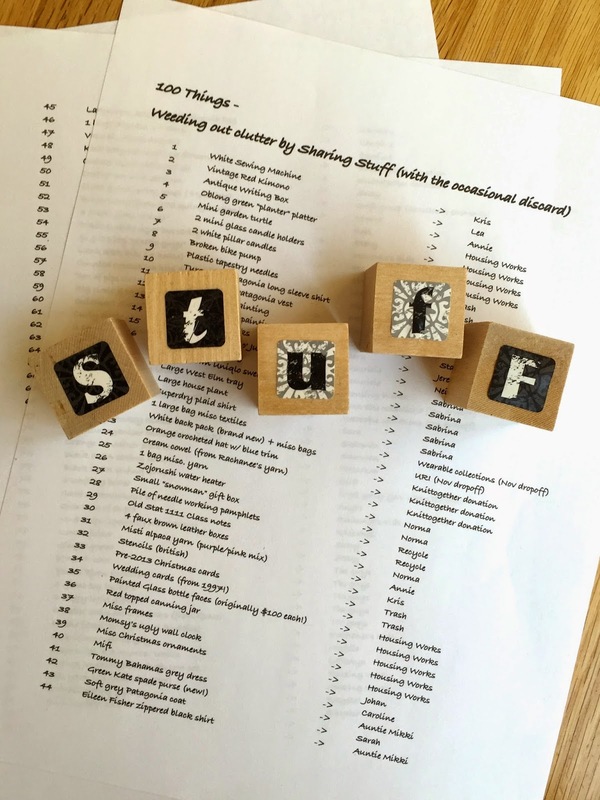 What if I sorted everything… and got rid of 100 things? “100 Things” sounded like a good hefty amount. I could do that. And so I started. One item might be a single houseplant. Another item might be one bag of clothes. How I counted depended on what the items were, how emotionally attached I was to them and where they were going. To help motivate myself, I kept of list of the items and what I did with them. Mostly to friends. I have all sorts of cool stuff. Much of it is collected over the years and will be enjoyed for a long time to come. But some of it just makes me feel guilty for spending money when I didn’t really want or need the thing. Since I’m not into punishing myself for shopping mistakes, I decided to gift away some pretty awesome things. The vintage silk kimono I bought as a Halloween costume one year went to Lea who loves all things Japanese. I sent the antique letter box home with Annie who was in the midst of creating a craft room for herself. My friend, Stacy, and I have very similar taste in art. So she got the giant painting by an artist we both admire. Since it was too big to move via cab, would you believe we walked that thing 2 miles from my home to hers? Some to Charity. Books and household items go to Housing Works. My knitted and crocheted hat and scarf sets were donated through the KnitTogether group. Some to Recycling. The almost-new clothes and shoes go to friends (one happy friend got the brand new No. 6 clogs I special ordered but then couldn’t wear). But the bags of ratty clothes and worn shoes get recycled through Wearable Collections. Occasionally the Trash. I hate to send things to landfill. But sometimes it has to happen. The hoarded box of plastic tapestry needles. The wedding cards from 18 years and 3 apartments ago (I probably should have recycled those, huh?). Just 12 more items to identify and move out of the apartment til I hit my goal of 100 things. Not bad, huh? Some of it was hard to give away. I definitely fought moments of guilt over being wasteful. But mostly it’s felt really good to have extra space in the apartment and to see how happy others get to receive my stuff. Please read “The One and Only Ivan” by Katherine Applegate. This beautiful, powerful story is both heartbreaking and laugh-out-loud funny. 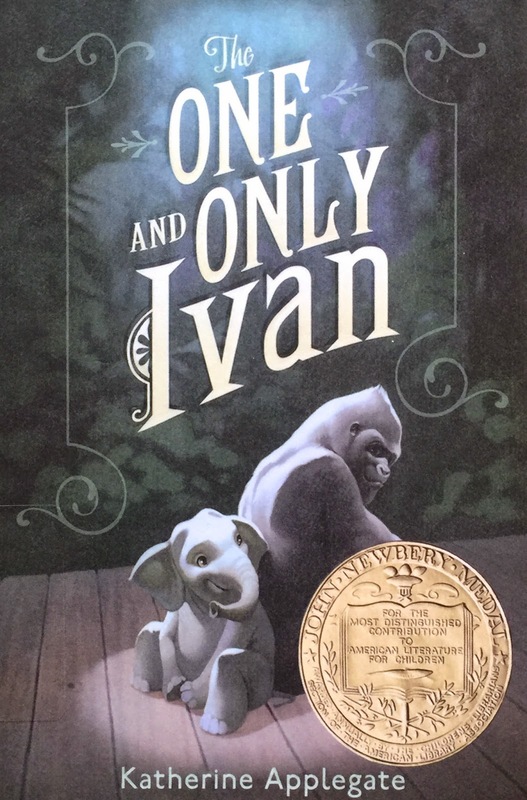 Technically, “The One and Only Ivan” does not belong on our “read aloud” list since my boys and I actually read the book silently; one after another this weekend. But I feel compelled to tell you about it since we loved it so much. Not a one of us could put down the book until we finished reading it. But we did pause our independent reading frequently to share especially hilarious comments and interesting facts with one another. There’s a lot of sadness in the story. Death. Animals in captivity. Animal cruelty. But there’s hope in the story too. “The One and Only Ivan” is actually inspired by a real Ivan. And in both life and story, Ivan gets a (relatively) happy ending.